Motorized blinds combine the high-quality manufacturing experience of our roller blinds with the latest electric technology so you can automatically remote control your blinds. We use 240V motors and comes with a 5-year warranty. The motors come in the size 45mm diameter. The motors are designed with a thermal cut out switch to prevent overheating after four minutes. Cedar Blinds services and products come with an automatic guarantee against faulty parts and workmanship. Your blinds are manufactured locally, you’ll enjoy a full five year warranty on all products purchased. That means peace of mind and assurance that you are getting only the best quality blinds that are made to high standards. Our installation team are clean and professional, qualified to carry out the important role of installing your new blinds. 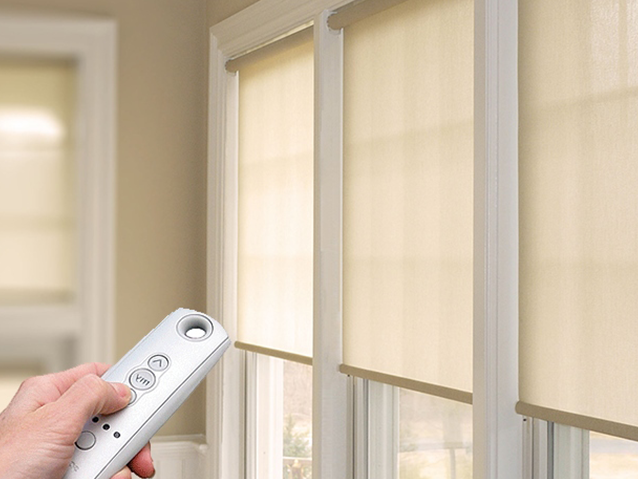 While on site, our blind technicians will demonstrate the mechanisms of the blinds, so you understand full operation and care to ensure a long life. The installation process is quick and efficient, with full instructions for caring for your blinds provided on site. See our blog page for Nanjulla’s blind care and cleaning tips and tricks! Want to Re-vanish, re-oil or change the colour of your blinds? Custom painting and re-fabrication enables you to change the colour of your existing cedar blinds without the cost of full replacement. We can paint any colour. It’s easy! and continue the rest after it.It’s easy! Simply provide us with the paint name, brand, and code for an exact match, or choose from a wide range of paint swatches. Note: Custom painting is only available for Cedar Blinds. Whether you want advice on your choice, or maybe have a question our team would love to help. Our number is FREEPHONE so it will not cost you a cent!